Completely protects your car's upholstery. 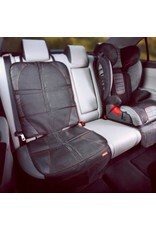 The Diono Ultra Mat is a car seat protector with a difference. The full length mat protects the entire vehicle seat from scratches and dents that can occur when a child’s car seat is installed. Suitable for use with rear-facing or forward-facing car seats, as well as infant carriers and booster seats, Ultra Mat is compatible with LATCH or seatbelt installation. With handy front organizer pockets to store travel essentials, it really is the ultimate undermat to protect your vehicle’s interior. The durable, tightly woven and coated surface resists dirt and liquids to help keep the mat clean while rubber panels ensure the car seat sits firmly on the mat. High density foam helps prevent wear and tear caused by pressure points. 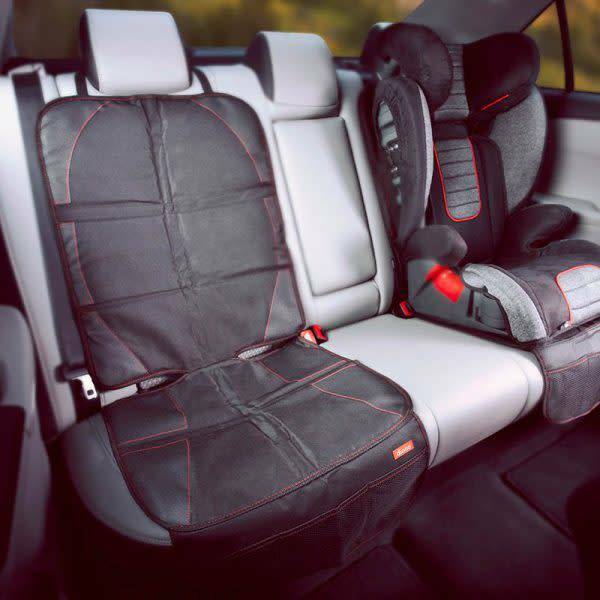 Featuring PentaLock technology with 5 carefully constructed layers, Ultra Mat completely protects your car upholstery against scratches and dents from a child car seat. The high density foam core and DuraBase layer distribute the car seat weight and prevent indentations in the vehicle upholstery/leather. A handy tab slips between the seat and back to keep the mat in position, and the FlexGrip backing contours to the shape of the car seat to ensure a secure fit and prevent slipping.